The Festival of Marketing 2017 saw the great and the good of marketing converge on Tobacco Dock, London for two days of back-to-back marketing seminars. There were 14 different streams, including a new stream on AI. 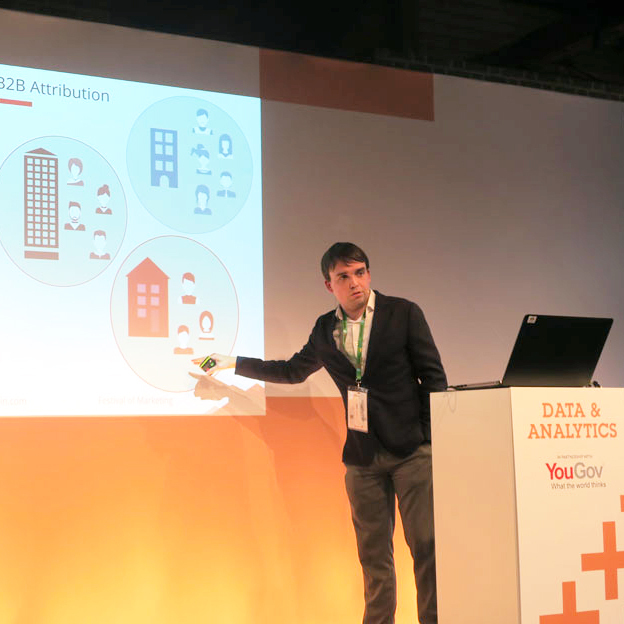 The Lynchpin team could be found in the festival village answering analytical questions and dilemmas a plenty, and our very own Tim Bush, Data Scientist took to the Data Analytics Stage to talk about the Lynchpin approach to Attribution Modelling. More and more companies are adopting attribution models, but 60% of those surveyed are unsure how happy they felt about their attribution model and only 11% felt very confident (as our recent Measurement and Analytics Survey found). With standing room only, he was happy to bust the myths that surround attribution projects, which are often the cause of the frustration around attribution. For B2B attribution projects, two levels need to be considered, because marketing has an impact at both and individual and a company level. First, it is important to attribute how marketing channels are driving conversions at the level of a whole company. Second, it is important to identify the strongest or most influential lead within the enterprise. Bringing this data together in the right way is more complex but a data science approach means it can be tailored specifically to the business. Myth 2, The Technology is good enough now to create accurate attribution models. Google 360 and Adobe suite do now have software solely for designed for attribution. However, attribution is not one size fits all for every business and quite simply bespoke models are better for the organisations KPIs. Furthermore, these seemingly slick solutions still require a data professional to gather the data and make sure it’s still being fed into the tool over time. Myth 3, It’s hard to secure budget and gain stakeholder backing. Internal stakeholder conflicts can make it difficult to get an attribution project off the ground. Different budget holders can be reluctant to adopt an attribution model as they feel it may undermine their area of expertise within the organisation. Organisations may have several agencies dealing with their media spend and trying to pull in results from these fractions may be difficult to administrate. It might be a simple case of inertia. Lynchpin have experience of multi-agency projects and understand how to manage the process. We believe in a transparent and iterative approach, where the assumptions and calculations behind the model are clear to everyone. Myth 4, Offline Channels can’t be measured. Sophisticated statistical models exist to measure the impact of offline media and econometric factors that will have an influence on attribution. We have over twenty five years’ experience of marrying data from offline and digital sources to produce insights that result in the ability to change marketing strategy and save media spend. If you would like to see the full deck which also includes two case studies of some of our recent projects. You can either download the deck here or view on slideshare. © 2018 Lynchpin Analytics Limited. All rights reserved.